The Duke and Duchess have completed a tour of the Taj Mahal in India, recreating the iconic photo of William's mother Diana, Princess of Wales. Diana was pictured sitting alone in front of the monument in February 1992 and the couple posed on the same bench on Saturday. The couple earlier left Bhutan on Saturday for the final stop on their seven-day tour. 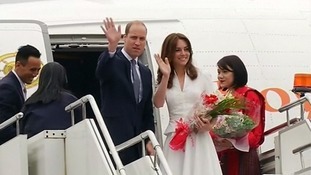 Prior to spending three days in Bhutan, William and Kate visited India and stayed at Kaziranga National Park. William and Kate made new memories at the Taj Mahal today as the happy royal couple visited the same monument to love where the prince's mother was famously pictured more than 20 years ago. As they reached the end of their official tour of India and Bhutan the couple posed on the same bench where Diana was pictured sitting alone in front of the monument in February 1992. Video report by ITV News Middle East Correspondent Geraint Vincent. The Duke and Duchess of Cambridge have recreated the famous photo of William's mother Diana, Princess of Wales, sitting in front of the Taj Mahal. Returning from the visit, the Duke described it as "stunning". The Duke and Duchess of Cambridge have arrived for a tour of the Taj Mahal in India. The Duke's mother Diana, Princess of Wales, was famously pictured sitting alone in front of the monument in February 1992. The couple were seen being given a tour of the grounds before entering the mausoleum. The Duke and Duchess of Cambridge left Bhutan on Saturday for the final stop on their seven-day tour of India and Bhutan. The Duchess was wearing a necklace as she walked along the red carpet with William to their plane - a gift from Queen Jetsun Pema of Bhutan. The couple are travelling to Agra, where they will tour the Taj Mahal. The Duke's mother Diana, Princess of Wales was famously pictured sitting alone in front of the monument in February 1992. The Duke and Duchess of Cambridge said they are "massively" missing their children, George, two and 11-month-old Charlotte, during their official tour of India and Bhutan. Prince William and Kate tried their hands at archery - with mixed results. Prince William and Kate were 'angry' to hear that poachers struck Kaziranga National Park killing a rhino just hours after their visit.